With the highest guest repeat ratio in the industry, Cunard Line enjoys a level of brand loyalty like no other cruise line. In support of this, Cunard operates the World Club - a members-only programme designed with one aim: to thank their guests for choosing to see the world on board "The Most Famous Ocean Liners in the World". With four tiers of membership, World Club members enjoy increasing levels of exclusive benefits. Entry level is SILVER - achieved when a guest books their first-ever Cunard voyage, right up to DIAMOND status - a level bestowed upon those who have spent at least 150 days at sea (or 15 cruises). As part of the continued development of the World Club, REM Productions are proud to have been appointed to publish an exclusive yearbook for the benefit of all World Club members. 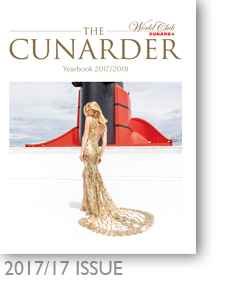 Initially, Cunard send out the CUNARDER Yearbook to all DIAMOND members. Thereafter, copies are made available for sale to all SILVER, GOLD, and PLATINUM members. As a corporate sponsor of the Prince's Trust, Cunard Line donate all profits from book sales directly to the charity.